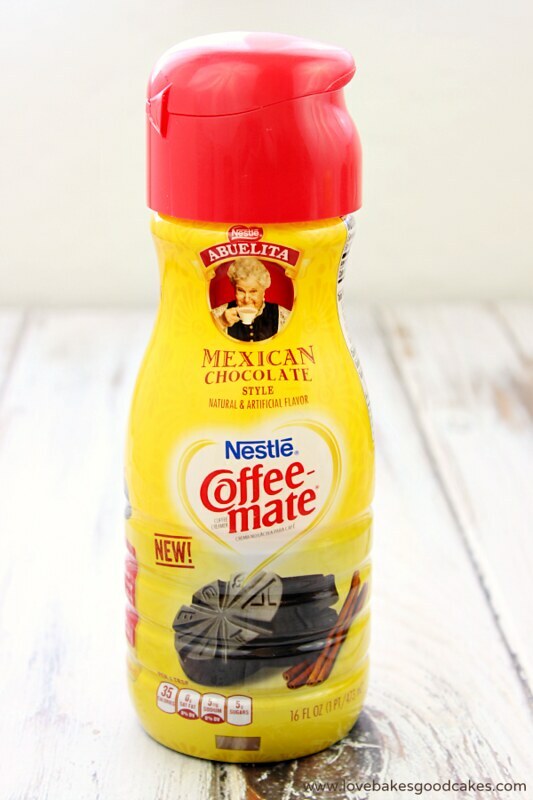 Coffee-mate Abuelita® Mexican Chocolate creamer is a silky, cinnamony, rich, authentic experience. Coffee-mate La Lechera® Dulce de Leche creamer is a creamy, dreamy, milk caramel caress from the Southern side of the continent! To find a store near you that carries these two new Coffee-mate Latin flavors, use this store locator tool. It is impossible not to fall in love with these two new flavors! Be sure to follow Coffee-mate on Twitter for more delicious fun and more giveaway opportunities! Add a touch of Latin to your day! 1. In a deep skillet or fryer, heat oil to 375°F. 2. Meanwhile, in a medium saucepan, bring the creamer, butter and salt just to a boil. Remove from the heat and stir in flour until the mixture forms a ball. Place the flour mixture in a mixing bowl and beat on low speed with an electric mixer for 3 minutes. Increase mixer speed to medium. Add eggs, one at a time, mixing well after each addition. Stop mixer and set dough aside. 3. In a separate container, mix the sugar and cinnamon. Set aside. 4. For the dipping sauce: Bring a double-broiler to a simmer over medium heat. Melt the Mexican Chocolate Drink tablets in the top of the double-broiler. Remove from the heat and add the heavy cream, stirring with a wooden spoon until smooth. 5. Spoon the flour mixture into a pastry bag fitted with a star-shaped tip. Carefully pipe the batter into 6-inch strips in the hot oil. Do not overcrowd the fryer. Cook for 4-7 minutes, turning once, or until the churros are lightly browned on both sides and cooked through. Remove with a metal slotted spoon to a paper towel-lined plate. 6. While the churros are still warm gently toss in the cinnamon-sugar mixture to coat. Serve with the dipping sauce. Thanks to my friends at Coffee-mate, one lucky Love Bakes Good Cakes reader will have the opportunity to win a custom designed coffee mug by Kathy Cano-Murillo of Crafty Chica (actual design may vary from any images shown), coasters and 2 full-value Coffee-mate product coupons ($31 ARV). Thanks Jamie!! Love Churros & Mexican Chocolate. To have them together is awesome!! Really looking forward to making these!! Is it wrong to want to make the dipping sauce first to dip everything in??!! Love the new creamers!! Oh boy oh boy! I love churros! So excited I can make these at home! Thats a tough one but probably the Dulce de Leche! These look delicious! 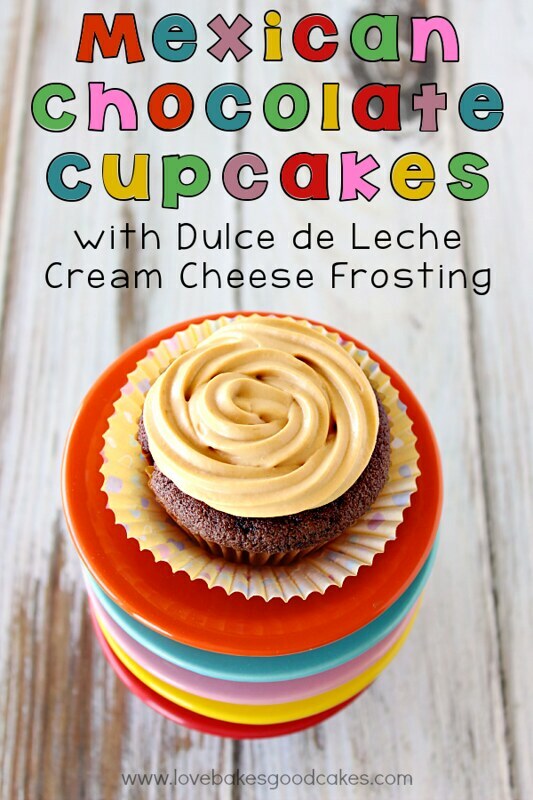 The Dulce de Leche Creamer sounds yummy! Oh my! I love Mexican food! Never thought I could make Mexican Churros! Glad you make it sound so easy:) I like the addition of the creamer in the recipe. Very creative! These look tasty! I can never pass on churros! Wow, I want to make these. It would be great with a Mexican dinner party. Thanks for the recipe and giveaway. My grandfather loves Churros. I'll have to try these sometime. Wow! Ok, Jamie, add these to things we're going to eat when I come to visit! 🙂 I think I might be drooling a little bit on my keyboard! Pinning, of course! Have a fabulous weekend! 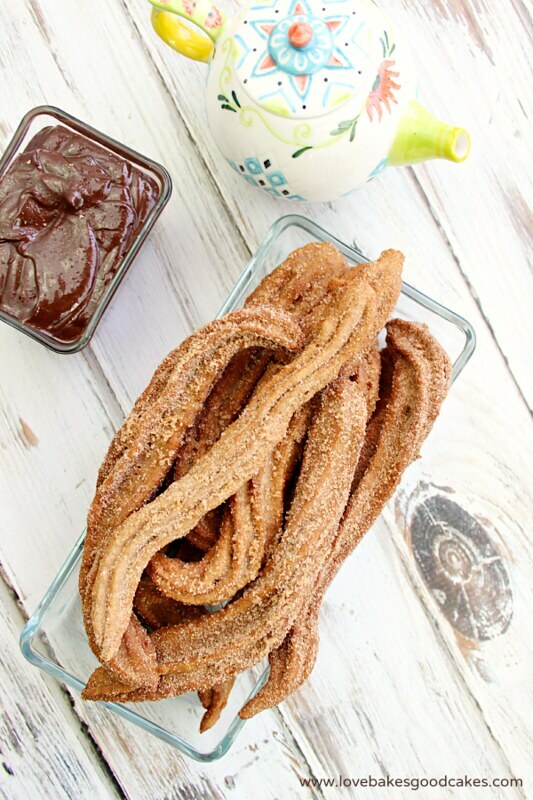 We will just love your Mexican Chocolate Churros, they look awesome! Thank you so much for sharing this awesome post with Full Plate Thursday and hope you are having a fantastic weekend! 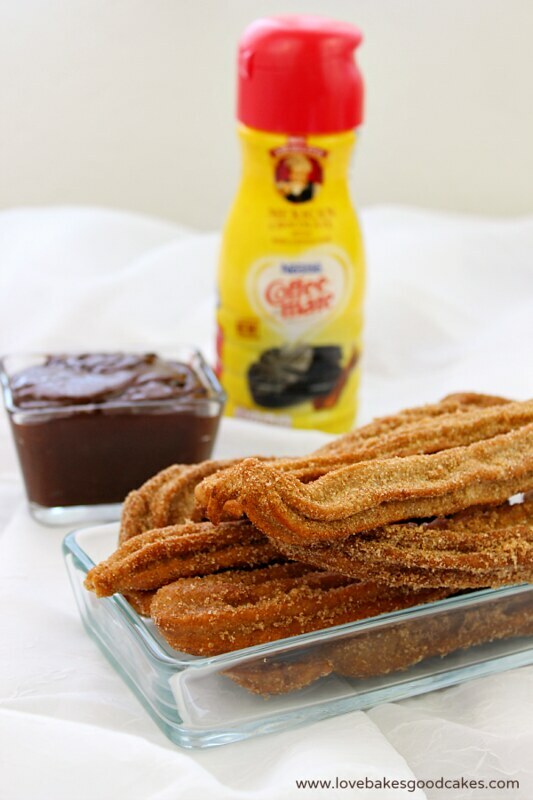 I HAVE to try this coffee creamer AND these churros! 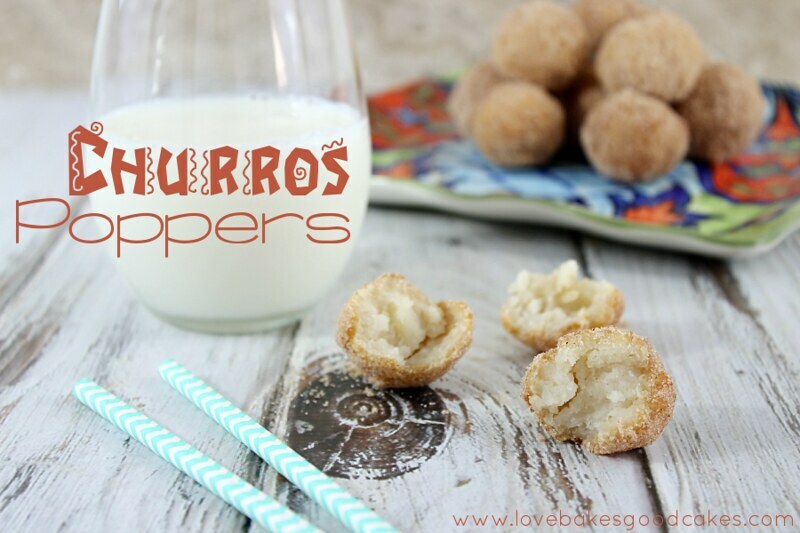 I've never thought to make homemade churros (frying scares me) but these would be worth the effort!!! 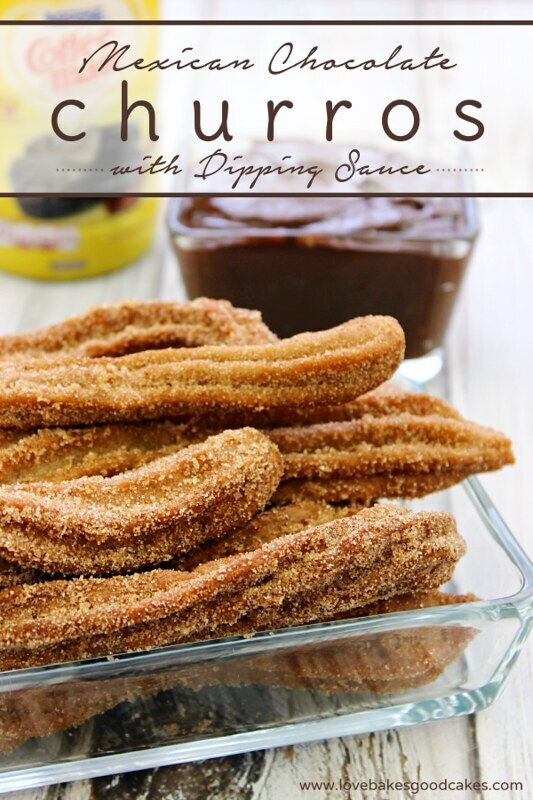 Oh these churros AND the chocolate sauce look AMAZING! Oh Yum! Those look and sound incredible. I've never thought to make churros. Genius!! Pinning and saving! Look yummy!!! 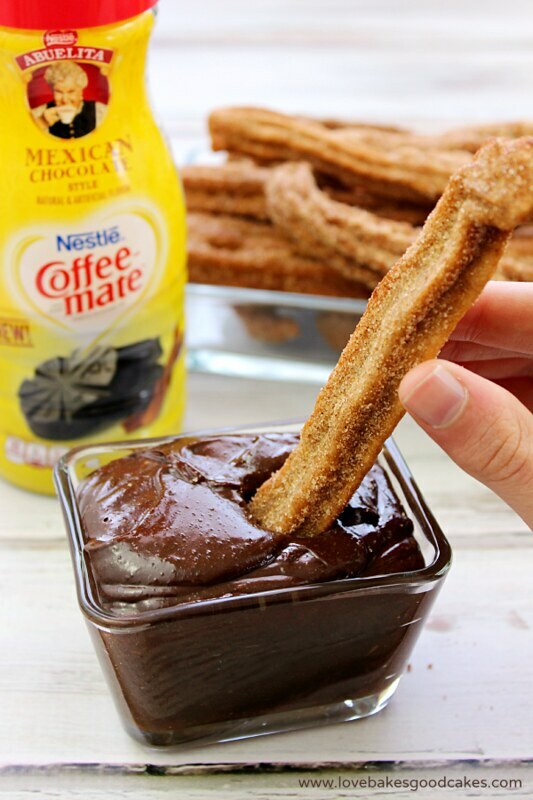 Which did you like better the water or the creamer when you made the Churros?